Bugbane Cimicifuga Ramosa Atropurpurea is a herbaceous perennial native to North America woodlands. Bugbane seeds can be started indoors or outdoors. Also known as Actaea Racemosa, Black Snakeroot, Black Cohosh, and Fairy Candles this wildflower has extremely ornamental, clumping foliage that changes its color from purple-green in spring to dark green in summer, and blooms with absolutely astonishing, tall, bottle-brush spikes of small ivory-white flowers. Bugbane flowers are strongly scented, and the blooming Bugbane floods the garden with the delightful fragrance, attracting a wide range of beneficial pollinators. Bugbane Cimicifuga is an excellent choice for creating a spectacular vertical accent in the back of the border, and this perennial plant is one of the best tall perennials for woodland and native planting. The cold, moist stratification is recommended for starting Cimicifuga Ramosa Atropurpurea seeds. 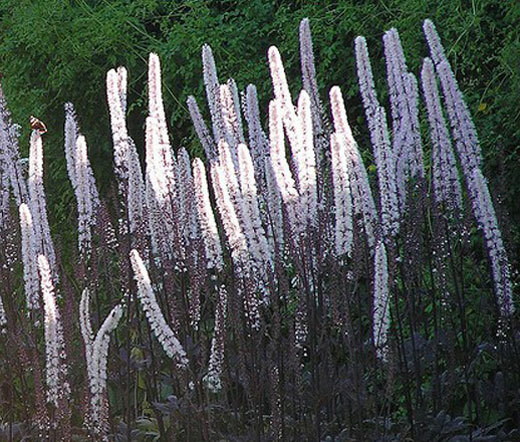 Black Cohosh grows best in shade or partial shade and likes rich, moist soil, but the plant can tolerate some sun if it is grown in a cool location with enough moisture provided. Bugbane is a superb cut flower.